If you are a fan of cheesy potatoes, then this Cheesy Au Gratin Potatoes Recipe is a must try. It’s so delicious and so filling, yet just 6 Points per serving. It’s such a great side dish recipe to serve that always ends up being a hit. By adding in some nonfat Greek yogurt to the cheese sauce, I was able to give it a lot more volume and some extra protein, while cutting out fat and calories. Seriously, my potato slices were swimming in cheese sauce, and that’s exactly how I like it! Because these au gratin potatoes are rich and filling, I’d suggest serving it as side to a light main dish, like grilled chicken or a salad. But these are definitely a carb and cheese lover’s dream. Enjoy! These cheesy potatoes are to die for…so creamy and rich, and absolutely smothered in cheese. 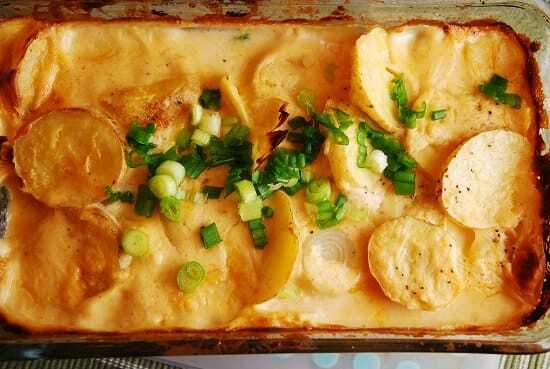 It’s a healthier version of a more traditional potatoes au gratin recipe and has a lot less calories and fat. Preheat oven to 400 degrees. Spray a 1 quart casserole dish with non-fat cooking spray. In a medium-size saucepan, melt butter over medium heat. Mix in the flour and salt, and stir constantly with a whisk for one minute. Stir in milk. Cook until mixture has thickened. Stir in cream cheese, shredded cheese, and yogurt all at once, and continue stirring until melted, about a minute or so. Pour cheese over the potatoes, and cover the dish with aluminum foil. Bake for about 1-1 ½ hours, or until potatoes are cooked through, and top of potatoes has begun to brown and crisp. I made these for Christmas dinner and they were fabulous! Making these now! But not sure how it’s all supposed to fit in a 1qt dish! :) have the potatoes layered in a 4qt dish, just waiting for my mixture to thicken…. Oh MAN. I can’t wait to try this!